Forthcoming event :- Saturday 10th January 2015. Work to do at the West Drift entrance but start at the East Drift by picking up a split or two and carrying it across to the West. Dave has plenty of work he still wants to do improving the access and now that we have a passable survey of the workings a small team can do the artefact hunt and attempt to find all the other hidden Jumper drills. I was at Park Pit on Friday with wobbly wheelbarrow and sturdy sack barrow and John arrived at lunchtime. He then disappeared back down the track to admire Pinky and Perky, the pot-bellied pigs, busily devouring as much as they could in the field below. We concentrated on removing rubbish, muck, concrete and more rubbish from inside the airlock and had got a significant amount removed by sunset. A couple of the roof slabs were too large so an attritional size reduction was developed i.e. standing the offending block on one end then allowing it to fall flat across a brick, resulting in a pulverised brick but also a block split into pieces of convenient handling size. As twilight descended and the back pains increased we had just decided to finish for the day when Jim turned up – nothing personal Jim, honest!! The horse gin platform cleared a week ago looks impressive and most of the trees affecting site remains are cleared. It has been suggested that the remaining undergrowth is not burnt but shifted to a location where it can act as a wildlife habitat away from the mining remains, which seems a good idea. We shall also leave alone the Provender House at the south end of the site as long as possible as it has certain creatures in residence. Yesterday was an easy day out at Sandsend; first because it was requested, and second because parking is free there for a couple of months. We wandered along the coast railway line through the alum quarries looking at various remains in bitterly cold weather until we got to Sandsend Tunnel where the 7 of us dared to venture inside discreetly. Unfortunately we were spotted by some walkers who attempted to follow through the appropriate trapdoor but found it mysteriously locked from the inside. 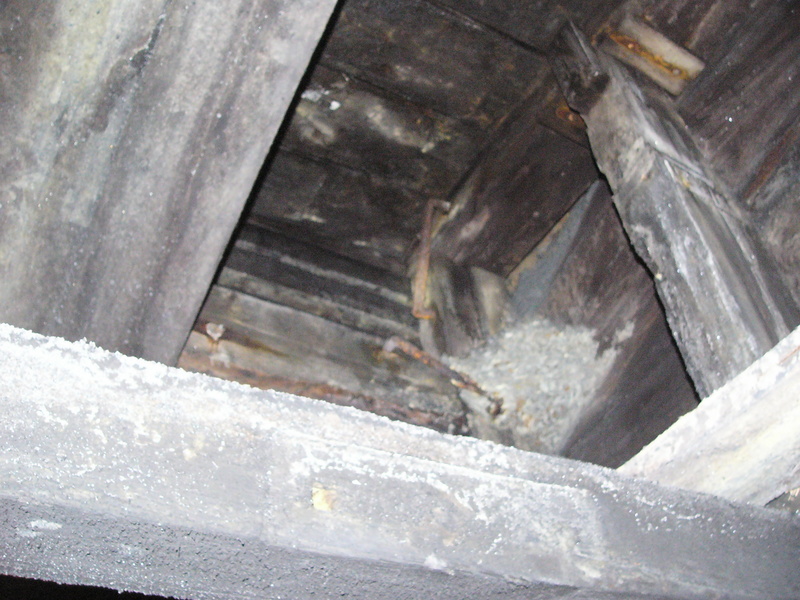 The tunnel is in good condition generally with only two sections of repaired brickwork bulging ominously. Plenty of water finds its way inside via the 5 ventilation shafts but was not really a problem in spite of it building up in places. Unfortunately some sad and immature moron has used a spray can to liven up most of the refuges with drawings and comments usually associated with the most unpleasant of public conveniences. The northern end of this tunnel has been moving for years and its collapse without blocking it has removed the most dangerous section. Lunch was taken in the open air near the south portal of Kettleness Tunnel from which the recent removal of sprawling trees has much improved the view of it. Inside we looked into the drift running out to the cliff face and spent time admiring an outcrop of jet; so soft and crumbly it was more like coal. From the north end of this tunnel we returned south along the cliff top tracing the route of the original attempt to build a railway along the cliff face. And it was literally along the cliff face at the top of the alum shale, a most unstable material, and with jet mining active at the base of the cliff it is no wonder the newly built trackbed was collapsing as quickly as it was completed. The Whitby, Redcar and Middlesbrough Union Railway was one of the most ill-conceived railways to be built in the Victorian era and the only credit coming out of the whole debacle was to the North Eastern Railway who bought the uncompleted railway cheaply then spent a huge amount of money to complete it, including the two tunnels just described, and had further huge bills to pay later when repairing the inadequate viaducts. No wonder this uneconomic route was closed in 1958 even before the days of Dr. Beeching. Inside Kettleness Tunnel in the northern of the two drifts to the cliff face to show how timbers could be connected together with bent spikes. 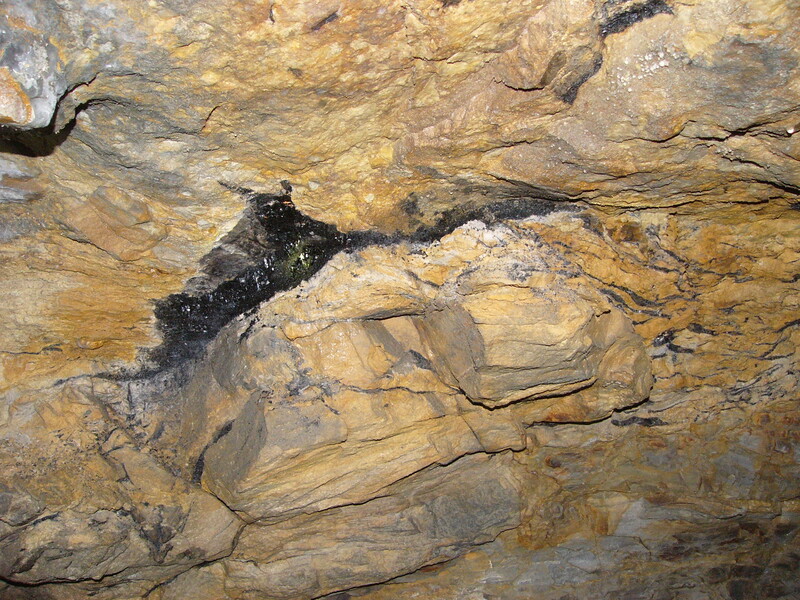 Inside the drift of Kettleness Tunnel showing the soft jet outcrop.